For my ultimate post of 2011, I would like to write about something that was little to not noticed at all, yet as crucial as the increased importance of extreme weather events : oil prices were at their highest average ever this year. According to some research carried out by the Cambridge Energy Research Associates (Cera) mentioned in Le Figaro [Fr] oil prices averaged $111 throughout 2011. The graph below brought to us by Le Figaro is all too clear : after the little respite given by the recession, oil prices are back going up and up and AWAY ! 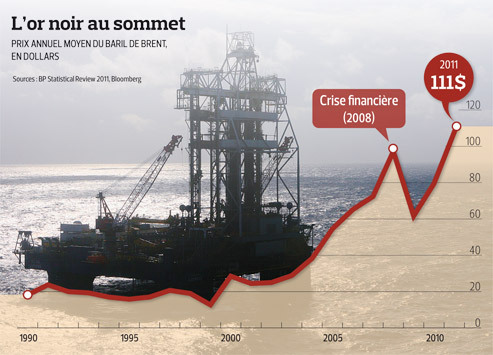 Oil prices 1990-2011 - Image courtesy of Le Figaro, data by BP and Bloomberg. I don’t know about you, but this kind of data really makes me think. On this quite somber note, I wish you a happy New Year’s Eve ! See you around in 2012 ! Edouard, i did my part–yesterday i rode home in an Amish wagon, the driver knew me and thought my groceries were too heavy.. these wagons are most uncomfortable and cold..but i felt honored at the gift of simplicity..
not suggesting we return to horse drawn carriages, but agree with you about mass transportation or more foot and bike traffic..it’s exercise and fresh air or at least..time to reflect upon the work day..
petroleum is not an option on a polluted planet in an endangered climate. As I am now commuting 40 miles per day by car with no mean to carshare, public transportation or else I am wishing I had an electric car.